Niveka Gregg and Tyler Pfahler were named Arcanum High School’s Students of the Month for January. 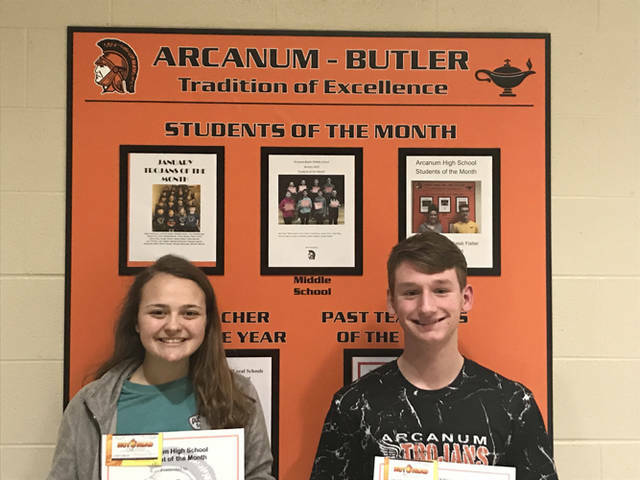 ARCANUM – Arcanum High School’s Students of the Month for January are Tyler Pfahler and Niveka Gregg. Selections were made by the faculty on the basis of accountability, honesty and service demonstrated at Arcanum High School. Pfahler and Gregg were nominated because of the accountability and service that they demonstrate at AHS. Pfahler was nominated because of the effort that he has demonstrated in class. He is responsible and does what is right in class. Gregg also leads through service at AHS. She is a great help to others in class. She works to make a difference each day. The Student of the Month program is sponsored by Hot Head Burritos and McDonald’s.